> SCROLL DOWN to the bottom of the page to view a slide show demonstrating details of the necklace and earrings. 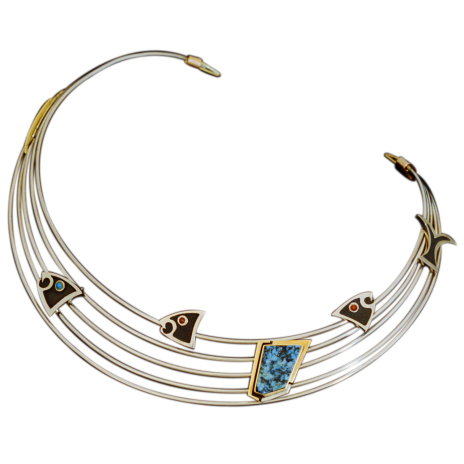 The above collar necklace, designed and hancrafted by Zhaawano in his wedding rings studio in the Netherlands, was born of a theme that is based on the age-old Teachings of the Midewiwin Society of his ancestors, the Ojibwe Anishinaabeg from the North American Great Lakes area. Divided over five elegantly curved white gold wires, the goldsmith fastened four moveable ornaments of precious metals and stones – to be placed in any desired position along the wires. These five wires symbolize the five main GIDOODEMINAANIG (our blood relations; animal totems) of the Anishinaabe Peoples: Ajiijaak (Crane), Makwa (bear), Waabizheshi (Marten), Maanameg (Catfish), and Mikinaak (Snapping Turtle). These (archaic) totems denote the five needs of the People and the five elementary functions of society: respectively LEADERSHIP, DEFENSE, SUSTENANCE, MEDICINE, LEARNING, and MEDICINE. relate to the various phases of LEARNING: the human cognitive process and the transfer of knowledge and know-how. 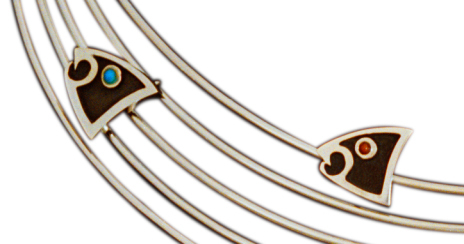 In honor of the concept of learning and knowledge, Zhaawano adorned the fish head ornament of the necklace with an eye of turquoise; the two post-back earrings – which he placed on the wires of the necklace when he took the photo – are watching the world through eyes of red coral. 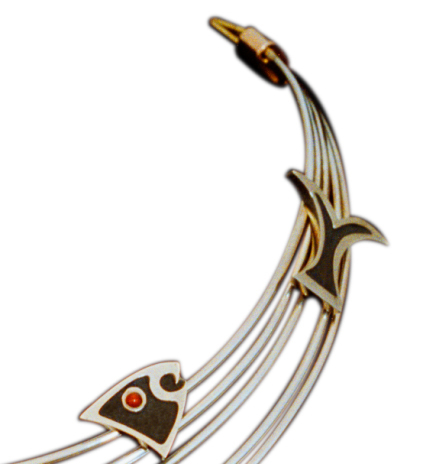 The concept of MINO BIMAADIZIWIN Zhaawano depicted by means of the asymmetrically cut turquoise stone, accentuated by a setting of 14K yellow and red gold and sterling silver. 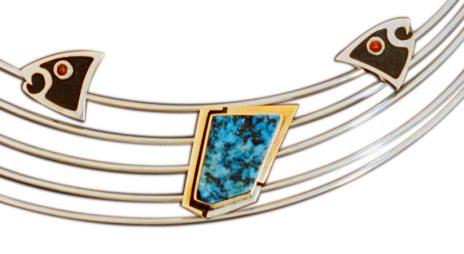 The rough surface and the black-veined matrix of the turquoise, along with the sharp and irregular corners of the setting symbolize the many dangers, disasters, and perils along life’s path. Beautiful jewelry, elegantly crafted and carrying symbolism that demonstrates deep spiritual depth. Chi-miigwech!